In a way, it seems wrong to reveal too much about These Associations, the first performance artwork commissioned by Unilever and Tate Modern for the cavernous Turbine Hall. Sehgal notoriously does not like his performances to be documented. His recent performance at Documenta13 in Kassel, in which performers moved about in a pitch-black space, talking and singing as the viewer moved around and in between them, did not even have a catalogue entry. The page was simply missing from the publication. This could be to do with the fact that so much of Sehgal's work only really 'works' for the viewer if they are approached with no little or no preconceptions. Not so much about the surprise or novelty aspect, or in order not to 'give the game away' – but about approaching the artwork as an 'experience' with Sehgal's ideas. There are no clear end-products or, it seems, 'perfect' outcomes. Therefore, It is tricky to sum up These Associations succinctly and would be misleading as the experience will depend very much on the time and day you visit, your own mood and level of engagement. 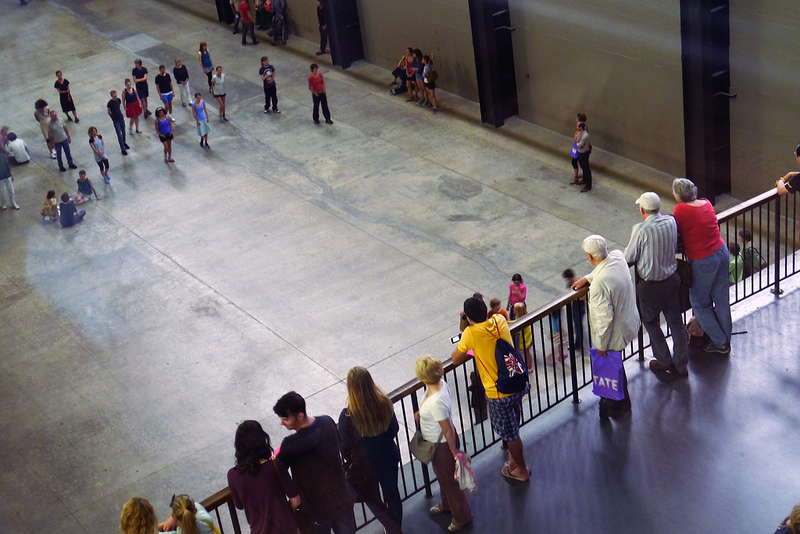 I watched a group of performers walk very slowly in a group from one end of the Turbine Hall to another. Members of the public occasionally approached them and asked them questions and it seemed they were happy to stop and talk or involve the person in their activity. The performers dressed as ordinary Tate visitors might but had, perhaps, a little more focused and 'on stage' look to them. They did not, of course, carry the bags or other paraphernalia involved in a cold Saturday gallery trek. The walking action was subtle and a little strange, why was everyone migrating from one side of the space to the other in such a measured, composed way and what were they moving away from or heading towards? Returning an hour or so later, I joined a swirl of circulating performers in a tight bundle, weaving in and out of the spiral. Myself and others moved with them, trying to catch a performers eye and ask them silently if it was okay to be participating or whether they saw it as disruption, an annoyance. One by one the performers, as if instigated by our presence within their midst, began to drop off and walk away. It was as if we, as audience, had both ruined something and done completely what was expected of us. A few moments later, only a handful of performers remained, both sitting and standing and they began to sing. 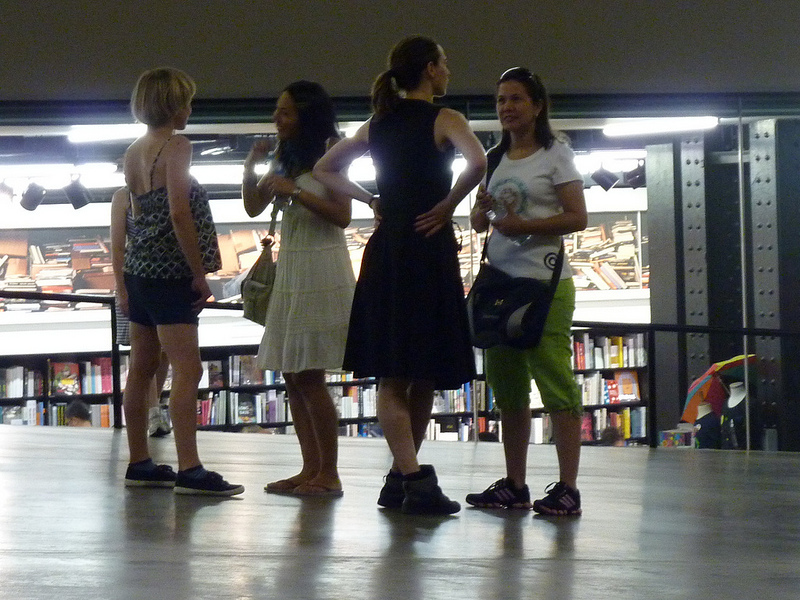 Harmonising as the lights in the Turbine Hall were switched up and down theatrically. 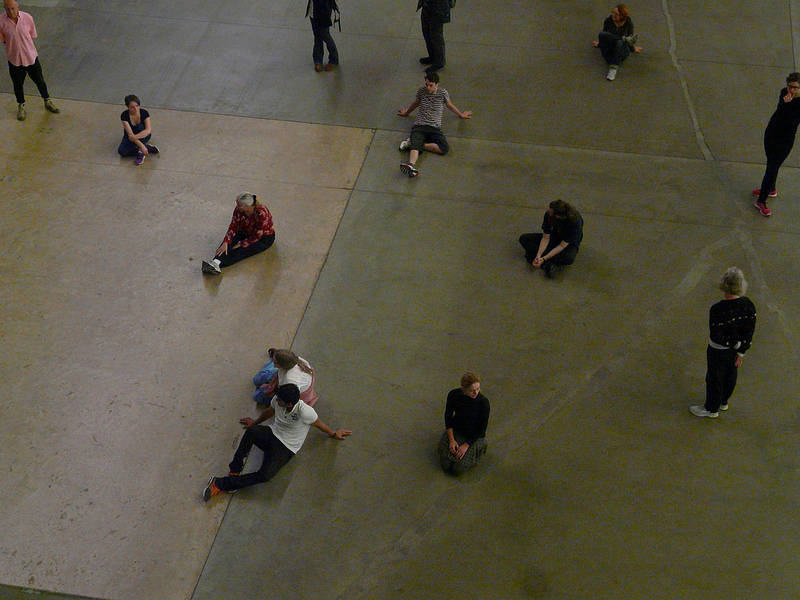 It gave the Hall a cathedral-like atmosphere and this drew attention from the windows of all the floors of the Tate. This, for me, was the magic moment of These Associations. Standing in the heart of the singing group, occasionally picking up the words, the melody. Joining in now and then but mainly looking at the singers, at the crowds of onlookers, hundreds of eyes on the balcony and at the windows. All of them looking at the performers and at us, the audience who stood with them. The magic of being inside and outside of the performance, conceptually and physically, simply and powerfully. Sometimes as a member of the art audience you want the work to want you, welcome you inside and need you to stir out of impassivity. I felt this here. These Associations runs until 28th October 2012.